Writing about 1970 has turned out to be harder than first anticipated. Sources differ as to what dolls appeared in 1970. Some sources still refer to the Sidepart Sindys, other sources quote 1970 as the year of the Centreparts. Centreparts have the same faces as Sideparts but their beautiful hair is parted in the middle – a centre parting – rather than to one side. Many collectors love the Centreparts above all other Sindys. Probably 1970 was a transition year, Sideparts were still sold and the 1970 Rovex Tri-ang Catalogue pictured Sideparts wearing the new outfits. But in all likelihood during the course of this year the Centreparts were appearing on the shelves. There are also some interesting cross-overs, such as the Centrepart Walker, dressed in a very similar outfit as the 1969 Sidepart Walker but she is definitely a Centrepart. This doll is not listed in the trade catalogues. The Tri-ang Christmas catalogue for 1970 is very interesting, it shows a Sidepart Walker, four Centrepart dolls and one new Lovely Lively Sindy. So we think in 1970, Sideparts are on the shelves in the shops at the beginning of the year, Centreparts start to come in as the year progresses, and in time for Christmas we see the Lovely Lively. We have therefore chosen to show the 1970s outfits on the doll which we think suits it best. And, it is likely that for the majority of 1970 that these outfits would have been worn by Sideparts, their brand new sisters the Centreparts, and by all the other Sindys, and Sindy's friends who had gone before them. We will show the Lovely Lively in 1971 to match the style catalogue. All the boxed dolls still came with the golden charm bracelet with the Sindy medallion. The poppers were still changing. More outfits were now using the plastic poppers. Plastic poppers have their problems, they are bulky and they can be very stiff to fasten and unfasten. Little hands were not always patient and so small doll's clothes were easily ripped or the popper itself was pulled off. Other outfits still used the painted metal poppers but the composition of the metal appears to have been also changing (probably to one with a higher iron content), and we start to see poppers which have a tendency to rust. As a consequence clothes of this era can sometimes have popper problems. The poppers may have ripped the fabric or rusted leaving unsightly marks on otherwise perfectly good garments. The labels are also changing and now you can find paper labels as well as the woven “Made in Hong Kong” labels. The first paper labels were very simply printed in black on white paper and they said “Made in Hong Kong”. Paper labels present a new issue for Sindy collectors – wash or not to wash. Sometimes when a new purchase really smells musty, the dilemma is to wash the outfit and perhaps loose the label or to keep it smelly (but who wants to add that to the collection or put it on a precious Sindy?). Things to note from the 1970 Style Catalogue. 'Tee-shirt' is now shown as accompanying the 'Leather Look(er)' skirt but its own reference has now been dropped. This illustration looks like the white version of 'Casual Moments' to us, and we still unable to establish what this top was. At some point during 1970 the Sidepart Sindy was replaced with the Centrepart. The outfit remained the same but as this outfit is most often associated with the Centreparts, we thought we would show you this photo of the two Sindys together because it was only when we looked closely that we realised that one of the matelot tops had been made upside down. This new design for this beautiful outfit was not shown in any of the style catalogues but it was displayed in the 1970 Tri-ang Christmas catalogue. It was a royal blue satin empire line dress with long sleeves and a high neck. It fastened at the back with two large white plastic poppers. The neck and the end of wide sleeves were decorated with a white nylon lace flower trim. She still wore the same crown and shoes of the earlier Miss Sindy outfit, but her sash was slightly different as this one fastened with a large white plastic popper (we have included an inset photo so that you can see this detail). This dress is very difficult to find in good condition, the seams have a tendency to fray because the material is very delicate and it is prone to fading so you will often find this dress with a mottled purple hue to the fabric. A new design of the all-in-one mini dress which was previously used for 1968 and 1969 'Fashion Girl'. The dress was still the same two-piece design to look like a mini skirt with braces over a short-sleeved top. The fuchsia pink top was still made of cotton but the skirt and faux braces were made of a pink and blue stylised floral nylon. There are a number of variations to the pattern but it is difficult to know whether they just different cuts from the same material which show a different part of the pattern or whether they are true variations. The dress fastened at the back with two large white plastic poppers. There are matching knickers for this outfit made from the same floral nylon. For Sindy's feet there was a pair of purple kitten heel court shoes. Colette Mansell in “The History of Sindy” also mentions a purple headband but we have never seen this. The original Sindy Walker is shown in this style catalogue but she is also now shown as available in a brand new outfit. She was given a yellow and green houndstooth printed check skirt pleated at the front (normally two pleats but we have a skirt with one pleat), made of a thick brushed cotton which fastened at the back of the waist with one white painted metal popper. There was a co-ordinating yellow ribbed turtle-neck sweater made of cotton with half-length sleeves which fastened at the back with two sewn-on snap fasteners. For her legs she was given a pair of knee-high yellow plastic boots. As with the previous Walker outfit Sindy was given an additional outfit. This time a multi-coloured floral coat dress. The Rovex Tri-ang trade catalogue for 1970 is rather confusing as it shows a purple and orange coat dress with matching orange shorts. It also appears to have a gold link chain belt, but this could simply be Sindy's medallion artfully displayed. We don't know if there was a separate belt. We have never seen this outfit and we are not sure if it ever went into production. The coat dress that we have is made of cotton. It has a deep blue background decorated with pink, green and white flowers. It had three-quarter length sleeves, a pink sewn-on collar and it fastened with two domed-shaped metal poppers, which can either be brass or chrome coloured (we have both). We believe this outfit came with extra shoes and that they were purple kitten heel court shoes. 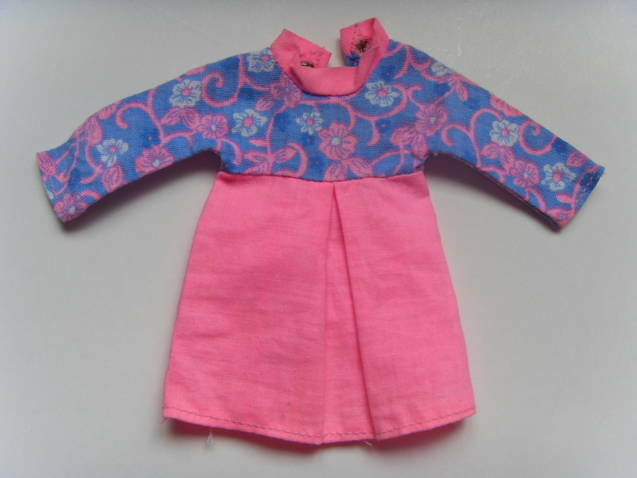 This outfit is often described as the “Trendy Walker outfit” and it was indeed used for a number of years, in this case the doll changed but the outfit did not. There is also a variation of this outfit which we will describe when we get to the Trendy Girls in 1972. A lovely outfit and a real favourite amongst collectors. The sleeveless dress was a maxi dress made of white cotton printed with royal blue flowers. It was trimmed with lace around the neck, had a royal blue satin ribbon belt sewn into the side seam at the waist, and a deep frill of the same dress material sewn around the bottom. It fastened with two white painted metal poppers at the back. There was a transparent stole in matching royal blue ribbed nylon and Sindy had red kitten heel court shoes for her feet. A couple of things to note, the style catalogue shows her wearing white daisy sandals, and there are variations to this outfit, including a white stole rather than one in blue, please see the comparison photos below. The photo top right above shows a variation of this outfit. Another very pretty outfit consisting long-sleeved pink nylon mini-dress with a turtle neck which fastened at the back with either two white painted or two chrome coloured metal poppers. It had a pink nylon embroidery waistcoat which was bound on the inside edges with a pink cotton binding. On each side of the front of the waistcoat there was a big gold coloured round button which could be fastened together with a fine gold chain to fasten the waistcoat. We have identified at least three different methods of securing the chain and it could be that some these are not original. There was a delicate matching handbag with a gold chain handle and it came with bright pink daisy sandals. There are at least two patterns for the embroidered waistcoat and handbag, the round, petal-shaped version and a stylised paisley pattern (see photo above right). A royal blue stretch-nylon all in one garment with long sleeves and a turtle neck which covered the feet. It fastened at the back of the neck with a sewn-on metal snap fastener. A very difficult outfit to find in good condition these days because it was made of a felt and just didn't last. The mini-coat had long sleeves (which were a little bit short on the arm) and a collar decorated with white saddle stitching. The same stitching was used to decorate the chest of the coat and a patch pocket on the left hand side of the coat. The coat fastened at the front with two chrome coloured metal poppers with the backs facing. The belt was a strip of white plastic attached at the front by one of these poppers. For her head Sindy had a bright red floral design headscarf and for her feet a pair of red kitten heel court shoes. Variations of the headscarf have been found and an example is shown in the photo below. This scarf came in a lot off ebay which included 'Winter Coat', it is the exact same size and shape as the version shown in the main photo above. You often see this outfit teamed up with white tights however these are not shown in the 1970 style catalogue and in the 1971 catalogue they are shown with the coat but as a separate item called 'Tights' that could be bought separately. A high-waisted mini-dress made of thick cotton. The yoke and long sleeves were made of a turquoise-blue floral trellis print decorated with pink, white & small yellow flowers with pink & white centres and pink leaves & stems which co-ordinated with a bright candy pink skirt and turtle-neck collar. The skirt had a deep front pleat and the dress fastened at the back with two dome-shaped chrome coloured metal poppers. We believe this dress came with pink daisy sandals. There is a variation of this dress (shown above right) which used a slightly different floral fabric for the yoke and sleeves. It was the same pattern but used different dyes. This fabric was cornflower blue decorated with pink, white & small deep blue flowers with pink & white centres and pink leaves & stems. This floral fabric was also used for Sindy's 1974 'Fun Fashion' Sleeveless Dress (see 1974 Sindy). This outfit was a long yellow maxi-coat made out of a sunshine yellow, soft cotton-backed textured PVC. The coat had a sewn on collar and sewn on belt made of the same fabric and it fastened with three large red plastic poppers. It came with a pair of red plastic knee high boots, similar to 'Shopping-in-the-Rain' but we think these were slightly harder. And, the outfit was embellished with a long rectangular scarf made of finely knitted red cotton, similar to the fabric used for Sindy's red skating tights. "Bang up-to-the-second in fashion! Long ankle-touching maxi coat in gorgeous gay yellow with bright red scarf and boots. My Maxi Raincoat costs about 12/6 in toyshops." For those of us who are too young to remember pounds, shillings and pence, 12/6 equals 62.5p. In 2010 (the latest conversion data available), £0 12s 6d from 1970 was worth £7.54 using the retail price index or £13.60 using average earnings.